Meet S. Karpagam, a woman with an unconventional teaching experience, pedagogic training and what many would call, an infectious laugh. The headmistress of the junior section at Rajghat Besant School, Karpagam (Kapooh as she likes to be called) has been teaching for the past two decades, in some of the most interesting and off beat schools in the nation. Starting her career in a school for children with different needs in Chennai, Vidyasagar (then The Spastics Society of India, Chennai), Kapooh has worked for the Krishnamurti Foundation of India, non-profit for teaching the underprivileged at Parikrma Foundation, and has taught across the country. We sat down with Kapooh and let her share her views on the opportunities, India has, for educators looking for avenues beyond the schools we are familiar with. She is more than excited to share her knowledge on who and where, one should apply, to pursue their love of teaching. So let’s ask her how she went about following her dreams of making a difference in the lives of children from all walks of life. Beyond chalk and board – Kapooh’s story about her experiences in unconventional teaching. Careerizma: Hi Kapooh. First of all thanks for taking out time for us. We’d like to start with why. Why teach? Or rather, when and how did you know that you’d like to become a teacher? Kapooh: Let me thank you all working in this space that is looking at careers differently and not with the same old conventional outlook. From the very beginning I had this deep disconnect and discontent about our education system. As I grew up, my interest kept changing from doctor to lawyer to musician to Tamil literature. I assumed my schooling would help me find my vocation that I might love, and spend the rest of my life doing, but instead it left me with a void. I wasn’t sure whether I wanted to become a teacher. All I knew was that I loved and still love to work with children. I connect with children very easily and this was right from an early age. I would often help out my neighborhood kids, explaining things to them. After writing their exams they would religiously come to me to show their gleeful faces of accomplishment, and that was the sign I guess. I didn’t pay much heed to that, then. After my graduation, a friend got me an interview for a PRO in VidyaSagar, formerly known as the Spastic Society of India. When I entered the school and looked at the children, something changed in me altogether. I knew this is the place I needed to be. Being with the children, from Vidyasagar, taught me everything I needed to know about being a teacher. It was here that I got introduced to the philosophy of J. Krishnamurti, a pioneer in education, in India and abroad. Teaching and Education for me started here. Careerizma: How would you define an unconventional school? Did you always want to be involved in such an unconventional setting or did this desire grow over time? Kapooh: Unconventional school – In my words I would say an unconventional school highlights neither failure nor success. It is more concerned with the overall development of the child – emotionally, physically and intellectually. These schools look at whether adults and children, alike, could retain the childlike wonderment and constantly be in the space of enquiry. Even though there are exams and tests, as they too follow a regular ICSE/CBSE type board, they are not considered the end all of everything in this setting. The emphasis is on a wholesome growth without the pressures of a testing system. I was brought up in the conventional setting and never knew there was such a thing as unconventional schooling. Krishnamurti’s book (K on Education), clicked with my discontent with the education system in India. So, my B.Ed less self, applied to such schools and never looked back. Careerizma: How did you come about taking up the opportunity of teaching differently-abled children? And what does one do to get to be involved in the lives of such children? Kapooh: I took to VidyaSagar, not as just a job to make money but to try something that made me happy. And being there, with the children, made me happy. As mentioned before, it happened by chance when a friend suggested it to me. If one seriously wants to pursue special education, there are a lot of courses – short term as well as long term – available at such schools/centres. One could always walk-in to get the details and could choose whether they would like to teach or probably work in administration. But my advice would be to first intern or volunteer to see if it is indeed your cup of tea, much like any other career. Careerizma: Please do share your experience of how it was. Kapooh: One word – AMAZING. It was a life changing path. I don’t know whether I would have been this happy or content with myself if I had gone any other way. Working with differently-abled children is like a realization that it is actually us who have the in(dis)ability to understand them and not the other way around. I often remember and quote the book All I really need to know I learned in Kindergarten by Robert Fulghum. My own personal take on it is All I really need to know I learned in VidyaSagar. These children taught me to be empathetic, sensitive and just love to be myself. They made me realize that all that they really long for is to be acknowledged as an individual, not a cause. It is here where I learnt that everyone, even children are really only looking to be heard and respected. Careerizma: What made you join the Krishnamurti Foundation? What is it about the schools, under the K Foundation, that drew you towards teaching there? There is a learning which begins with self-knowledge, a learning which comes with awareness of your everyday activities: what you do, what you think, what your relationship with another is, how your mind responds to every incident and challenge of your daily life. If you are not aware of your response to every challenge in life, there is no self-knowledge. It made me realize that learning and growth is more than just as gained from traditional classroom learning. The awareness of your self, everything and everyone around us is the beginning of a knowledge base. Careerizma: What are the usual requirements for teaching in K schools? Kapooh: Deep compassion for life, education, for oneself – willingness to look at one’s own conditioning and the willingness to unlearn & relearn, question with utter sense of responsibility. As far as qualifications are concerned, one needs to have a B.Ed only for high school, not for the grades below. For the schools for the underprivileged, one doesn’t require to have a B.Ed. Careerizma: Please do share with us your experience at teaching at the Parikrma Foundation in Bangalore. Historically it is hard to keep up attendance in such schools for the financially under privileged. How does Parikrma manage to be so successful at it? Kapooh: The short time that I spent at Parikrma was truly very educating for me. Here were children from a belt of India which is still struggling to make ends meet. Gathering young children from such an environment and trying to get them to make education one of their priorities is truly challenging. Traditionally it has been found that students drop out very quickly to go make ends meet instead. The challenge for us teachers then become to make the content of the education rich enough to keep students wanting to come back. 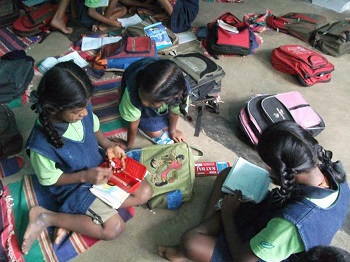 Parikrma has a wonderful program to bring about an overall development of its children. They have what is called a 360 degree development and an End to End program to ensure that not only are the students provided with knowledge but also their health care, food, during school, as well as vocational training for jobs are amply provided. My takeaway from Parikrma was that if you want to be teaching then you should be able to empathize with their needs too. As far as practical qualifications, one doesn’t require to have a B.Ed. What they need are individuals who are academically proficient, have leadership skills and are able to organize people to increase their interest in education. Careerizma: So we have talked about your experience in teaching the differently abled at Vidyasagar, the financially underprivileged at Parikrma and your lifelong relationship with Krishnamurti’s philosophies and KFI schools. What would be your advice to someone who is interested in following the path of unconventional teaching but hasn’t explored the avenues? Kapooh: If you have the passion, for education and learning, I guess the opportunities are plenty and schools like KFI, Parikrma and Vidyasagar are always open for fresh applicants as well as experienced teachers. It is also good for individuals who are interested in teaching and are looking to change their course of current career. My recommendation is to keep an open mind. There are challenges involved in working in such schools, much like challenges one would face in any work place. But it is an absolutely fulfilling experience to be so wholly involved in the lives of children who make those challenges fall short. Careerizma: And finally, do you keep in touch with your former students? Do they make you feel like you have had the best job in the world? Kapooh: Very much yes, thanks to social media. I think when they relate to me, the way they do, it is an acknowledgement of our relationship and I do take great pride in having taught these kids, watched them grow and in turn grow up with them. As I reflect back, these children have made me what I am today. All my children are my teachers who taught me the greatest significance of my life. I don’t want to compare this vocation with any other. I am happy in whatever I did and am doing. I guess it is that feeling, in doing something, which is the key ingredient in making our respective jobs, the best job in the world. …when the competitive spirit has ceased. So here’s to striving for the wonder years of every child’s childhood. I wish to choose the same path. Please guide me to get involved in the same journey.